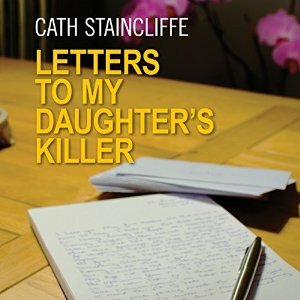 Cath Staincliffe is fast becoming one of my favourite crime writers who don’t write crime fiction. At least not the traditional kind. If there is a common theme to those of her books that I’ve read (which do not include any of her series-based novels) it is that crimes themselves are not nearly as interesting as their impact. On victims. On perpetrators. On witnesses. Or, as in this case, on a loved one left behind struggling to come to grips with sudden, senseless loss. As suggested by its title this book offers a series of letters from Ruth Sutton to the person who murdered her adult daughter Lizzie. And just in case you’re under some illusion that these letters are part of some forgiving catharsis for someone who manages to rise above it all let me tell you that the first letter opens with the words “I hate you” and the book doesn’t let up from that moment. As well as telling us the circumstances of Lizzie’s murder and giving us a first-hand account of the subsequent investigation and trial, Ruth’s letters reveal she is consumed by the grief and hatred that the killer’s actions have resulted in. Before the murder Ruth is entirely normal. Just like us. Divorced. A grandmother. A librarian. An allotment gardener. But when she becomes the mother of a murder victim it is as if she ceases to be anything else. Having listened to the audio version of the book superbly narrated by Julia Franklin I feel like I really was inside Ruth’s head and completely understood her debilitating anger, her misplaced but completely realistic guilt, her lack of willingness to forgive. How could it be any other way? Who are these buffoons who talk of moving on? The book also offers genuine insight into a subject that needs to be exposed with as much sunlight as we can collectively muster but I shall so no more about that here (I’m still contemplating a further discussion of this novel with clearly labelled spoiler warnings). LETTERS TO MY DAUGHTER’S KILLER was a tough read for me and I’m not a mother. I imagine if you are, or if you have had some personal experience of the kind of circumstances that surround Lizzie’s murder the book would be doubly harrowing. Still I can’t help but recommend it. Staincliffe is a terrific writer and bringer-to-life of real human beings. An earlier novel of Cath Staincliffe’s, SPLIT SECOND, remains one of my very favourite novels of recent years. I like Staincliffe’s work too, Bernadette, and I think that’s exactly why: she shows us real characters. We get to see the impact of murder, and it’s quite realistic. I’m very glad you thought this was a well-done read. Staincliffe’s novels are not ‘jolly romps,’ but she is truly absorbing, I think. This book is definitely on my list of books to be read. I haven’t read anything by Staincliffe, although I have read a lot about her books. This is a good introduction. I would normally start with series books, but maybe I can find one of each. I think I would like this one, but would like to start with something else by her first. I have this audio book out on loan from my local library so your review could not be more timely. I was listening to it last night and fell asleep during the first disc. I shall be playing it again tonight because I found it arresting and had I not been so tired I would have got a lot further. I also borrowed Dorothy Sayers’ Clouds of Witness read by Ian Carmichael for a change of pace. Thanks Bernadette for your review. I read her book entitled “Split Second.” It was very moving, took three characters’ viewpoints and showed how they were each impacted by a fatal stabbing by white teen-agers of an Afro-British young man, and the near death of another young man who tried to stop it. It was very good, not what I’m used to reading. But good to read nevertheless. of my long-gone relatives, and how they thought, spoke and acted. Sometimes an overly emotional read is not what you need – I certainly understand that Kathy. Had to come back and say I found the story compelling and Julia Franklin’s narration faultless. I shall be thinking about this story for a very long time. Totally agree with your review. Glad you found the audio book a worthwhile listen Sue. I’m still mulling over the story – still feel like Ruth’s voice is in my head.